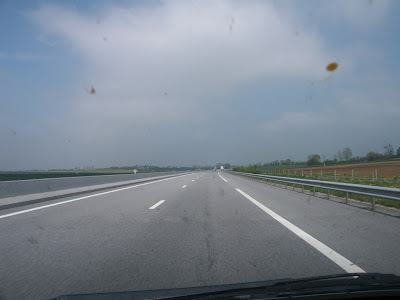 Ask any Australian, and they will tell you the received wisdom is that the roads of Europe are crammed full of traffic all going nowhere fast. These photos were taken on a recent drive back from Preuilly to London. You could probably put them in order for yourself just by looking at the grot accumulating on the windscreen. 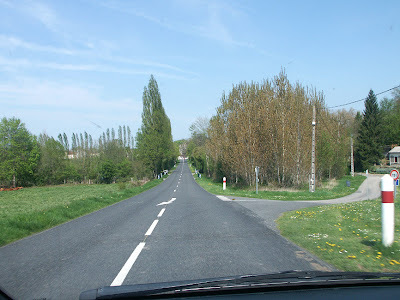 There is no trickery involved here - this really is how the roads are in France - IF you're not driving on the first (or last) day of the school holidays, a Sunday afternoon, or in Paris. The way to check out what the traffic conditions are likely to be is on the Bison Futé website. Not only is there a map showing problems in real time, on this page you can download a prediction for the rest of the year about how much traffic is likely to be on the roads. 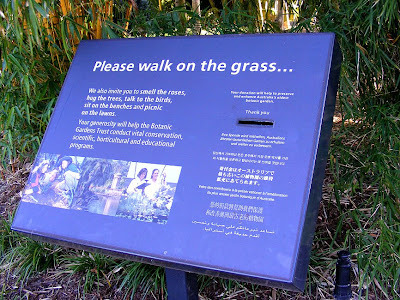 At the end of my recent visit to Australia, I had a day in Sydney. I arranged to meet a friend at the Powerhouse Museum, and we mooched around the Rocks (visiting the Craft NSW Gallery), Darling Harbour and Circular Quay and the Botanic Gardens. At the Powerhouse I learned about the remarkable Lucien Henry, a Frenchman exiled to New Caledonia after the political upheavals of 1871, who then made his way to Australia, where he became an influential artist, designer and teacher, one of the first to encourage the use of Australian imagery. Can you tell we are not in France? 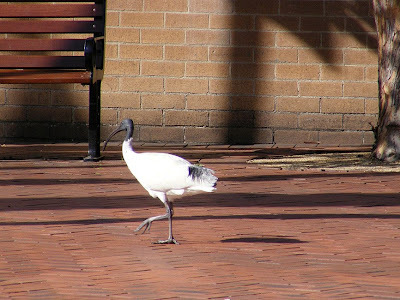 Australian White Ibis Threskiornis molucca amble freely around Darling Harbour. 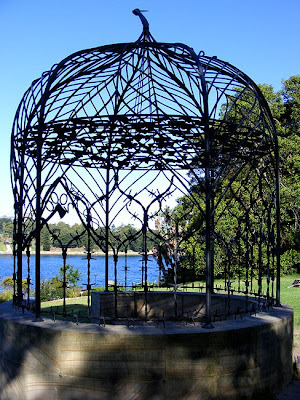 A Folly for Mrs Macquarie. Notice anything peculiar? 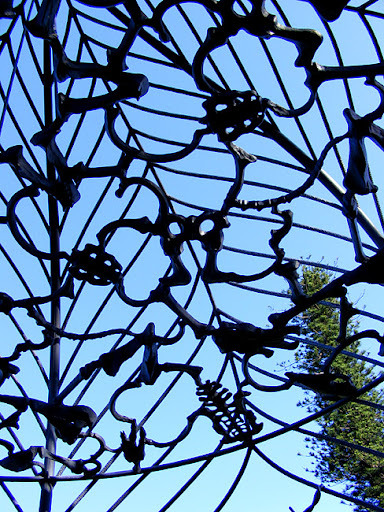 A detail of the 'ceiling' can be seen here. 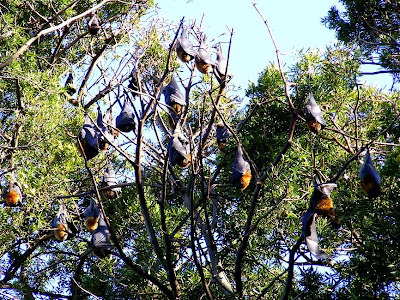 There is a large, smelly and vociferous colony of Grey-headed Flying Foxes Pteropus poliocephalus in the Botanic Gardens. 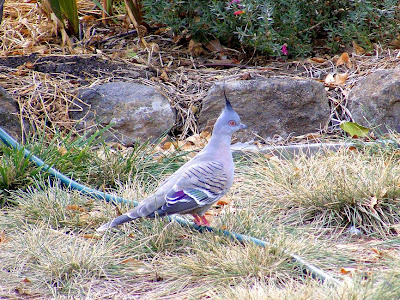 Mostly they just hang around sleeping during the day, but you can usually see one or two on the wing. 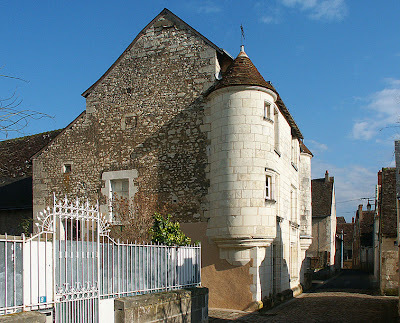 The village of La Roche Posay is about 12km from Preuilly sur Claise, and sits on the bank of the Creuse river at its confluence with the Gartempe. 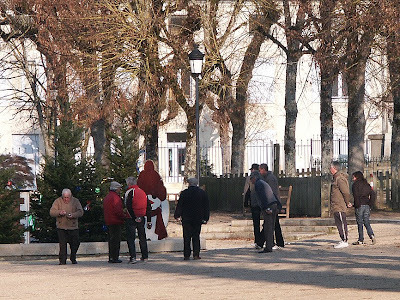 The village itself is attractive and is still a curist (health tourist) destination, with many visits paid for by the French welfare system for the treatment of various dermatological ills. 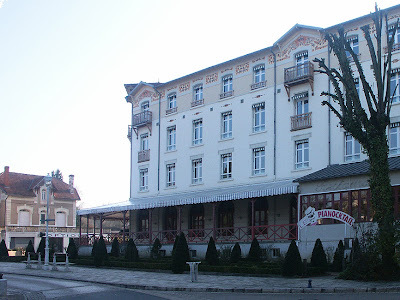 Because of this it has a huge number of hotels, lodges and apartments available compared with any other French village of the same size (population 1400). There are a number of spas dotted around town, as well as parks, a golf course, and a good scattering of cafes and restaurants. There is also a casino and horse racing course. They hold various music festivals during the year, based around the town square, and during summer it is a very busy, bustling town. During winter, however, most of the spas close (I believe that of the 3 spas in town, only one remains partially open), the hotels, cafes and restaurants take their holidays and the town reverts to being a quite little backwater. *La Roche Posay is not to be confused with Roche Pharmaceuticals, a completely unrelated Swiss/USA company. 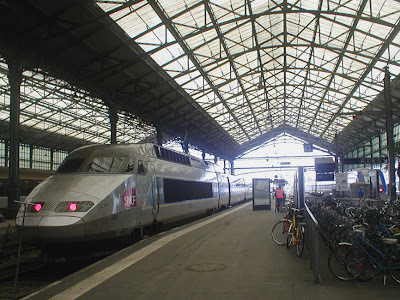 Last year Susan and I travelled to Preuilly sur Claise to London by plane and bus, which involved spending a number of hours in Tours near the station. At the time I mentioned that the station looks sort of tropical, but really needs palm trees. 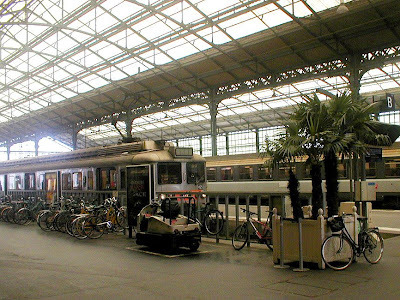 A couple of weeks ago I was in Tours again, and was surprised to see the station does have palm trees outside. I naturally took this as a sign of a growing influence of this blog , but a close observation of the photo posted shows that the station had palm trees last year too. I offer as my defence the fact they are small(ish) palm trees in Versailles planters. planters inside the station, too. The station was designed by Victor Alexandre Frederic Laloux (Tours, 15 November 1850 – Paris, 1937), a French Beaux-Arts architect best remembered for the 1900 stone façade of the Paris Gare d'Orsay, now the Musée d'Orsay. Laloux worked in a highly ornamented style and taught at the École des Beaux-Arts workshop, where his students included François-Benjamin Chaussemiche. Other work includes the Embassy of the United States in Paris (with American architect William Delano) and the Basilica of St. Martin in Tours. It was built between the years of 1896 and 1898 by Moisant-Laurent-Savey, who also built: Gymnase Jean-Jaurès, Paris, Viaduc de la métro ligne no. 2, Paris, and the Gare de Nice. They also worked on the Musée d'Orsay and the Grand Palais, in Paris. I like Tours station, even on a very quiet Easter Monday. It is very different to any of the stations in London - the trains aren't hidden, and the building isn't full of shops - 2 newsagents, a baguette shop and an information kiosk (so no opportunity for last minute sock or tie purchases) - and that's your lot. Boeuf Bourguignon – pronounced something like 'buhf boor-gee-nyawn' – is a classic French dish that everyone has heard of, and probably eaten. It is the flash cousin of the country style daube de boeuf, which is what I usually make. 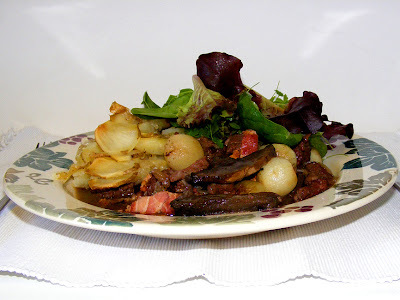 A daube only requires beef, red wine, sliced onions and seasonings, whereas the Burgundy style dish is enhanced with whole baby onions, lardons (cubes of bacon) and sliced flat dark mushrooms. I used the Delia recipe for my boeuf bourguignon. It's not really necessary to be pedantic about sourcing Burgundian wine for this recipe. Most red wines will be fine. Personally, I would prefer larger pieces of meat than shown above, but I purchased it pre-cut, as that was the best buy, so made a compromise. Certainly for a daube I would use 5-10 cm cubes. I served it with a baby leaf salad and pommes de terre boulangère ie thinly sliced potatoes, sprinkled with chopped onions, arranged in layers and cooked in stock (or half stock, half milk) in a shallow oven dish. 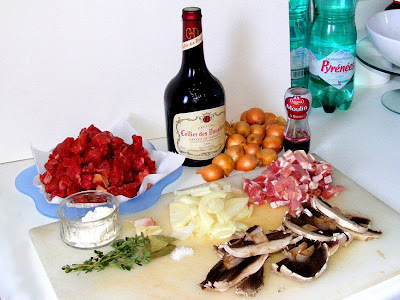 Boeuf Bourguignon needs to slow cook for about 3 hours, but Ken, over on Living the Life in Saint-Aignan, recently posted a recipe using meatballs, which took much less time. Today's post is written by Dave Lovell, who Susan met through her work a few years ago. 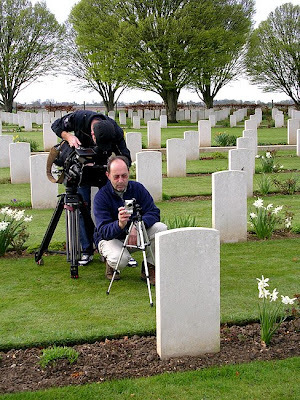 He is a volunteer in his spare time with The War Graves Photographic Project, which is aiming to photograph every Commonwealth war grave and memorial from World War I to the current day world wide, making the images available online, and complementing the work and records of the Commonwealth War Graves Commission. 25 April is ANZAC Day in Australia, a public holiday, when those killed in war are remembered. Villers-Bretonneux Commonwealth War Cemetery is the site of the Australian War Memorial in France. There is also a new website, Remembering Fromelles, for relatives of the British and Australian troops buried in some recently discovered burial pits. The aim is to exhume the bodies, identify as many as possible and create a new cemetery. Related articles can be found on This French Life. I got my call up on 16th April 2008. 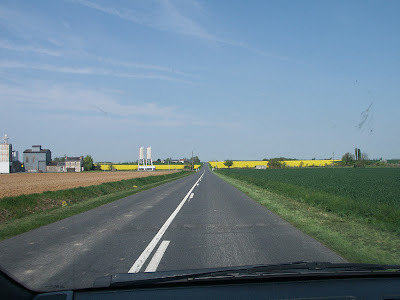 When I reached Villers-Bretonneux thankfully the Aussies I met were dashing and friendly. The Australian Memorial and Cemetery bears witness to the “dash and brutal aggression” the men of the Australian Brigade showed. These were men who clearly did not count the cost, even though the cost was heavy: 610 headstones and another 10861 names on the memorial bear testimony to that cost. The headstones give some measure of their bravery, recognised in 30 Military Medals alone. The wind was cold, the skies were grey, the ground was wet but I was pleased to be there. 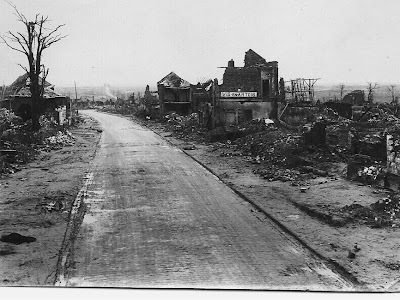 It’s a relatively short drive from my home in the East of Paris and, as I throttled the hire car across the plains of Picardie, my thoughts turned to my Father and family members who had witnessed first-hand the horrors of war. Mine however was to be a more pleasant experience but challenging in its own way. An email had come from the coordinator of the War Grave Photographic Project www.twgpp.org - could I meet an Australian film crew from the ‘Today’ TV programme and do an interview about TWGPP? Saturday was an early start, well early for a weekend. As I travelled North my spirits went South, the skies dropped and soon the rain too. Visibility was about 500 metres on arrival, but the Brasserie in the village looked a likely point of retreat. And then logic kicked in, the weather could get worse, 600 photos will take all day, and tomorrow might be ten times worse. So on with the boots, on with the cagoule, up with the umbrella. 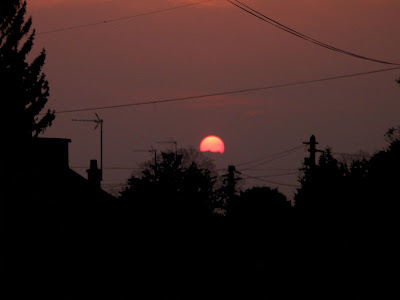 The afternoon quickly approached and passed equally quickly. Battery flattened I switched to my wife’s camera. Now all our memory cards were full and my joints were decidedly aching but the good news? Only twenty to go! And then it struck me…no call from the Producer and it's 17.00 already. So a little dejectedly it’s back to Paris, meet my wife off Eurostar and dine at Chez Gudule. At 21.00 with joints feeling the benefit of lubrication from the odd beer and un verre du vin rouge or three, the phone rings - at last arrangements for the TV shoot are made. The filming took an hour or so but it stayed on the cutting room floor! It stayed there because of course there were more moving stories to be told. Stories of men who gave their all - we will remember them! The photo for today's title piece was taken just after Christmas 2005 at the Villers-Bretonneux Commonwealth War Cemetery. 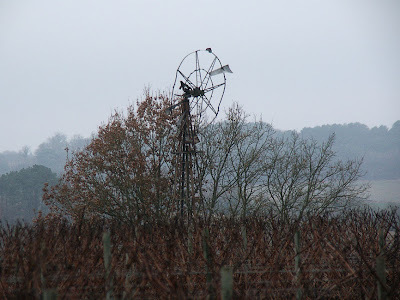 This windmill is in the vinyard of our nearest commercial winery, Domaine du Ris. 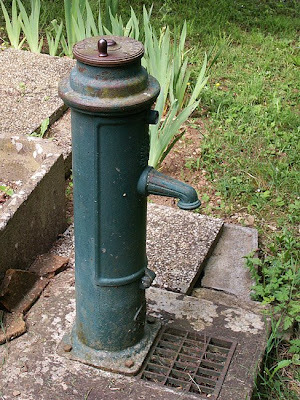 I assume it was once used for pumping water. It isn't an Éolienne Bollée, thats for sure! 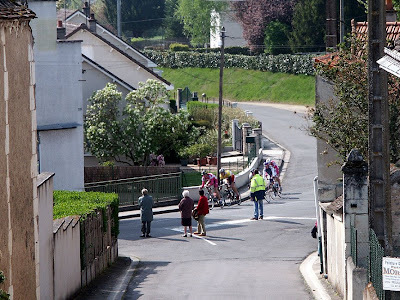 As you drive around rural France you will often encounter this man and his brethren - the common cyclist - wobbling his way along the road. He is not to be confused with the all over body condommed speed cyclist, a much more confident beast who is seen only at the weekends (although once a year the professional variety as shown here can be seen during the week, too) and usually in groups; the common cyclist can be seen on any day of the week, usually in packs of one. 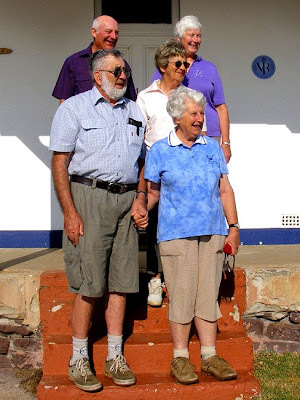 The main reason for my recent visit to Australia was to attend my parents' 50th wedding anniversairy. My sister organised for me, our parents and the wedding party (all aunts and uncles) to stay the weekend in the lighthouse cottages at Green Cape, part of Ben Boyd National Park on the southern New South Wales coast. We were a party of 10, and most of those attending I had not seen for 30 years. We got on marvellously well, and a great time was had by all. A selection of photos from the weekend follows, and more photos can be seen here. Lace Monitor Varanus varius. 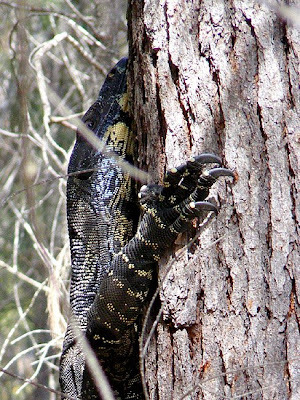 A type of goanna, this was the most magnificent specimen I have ever seen. It was about 1.5m long, and dramatically coloured. Look at those claws! 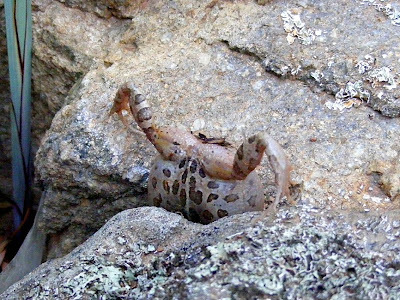 These lizards have a reputation for running up the nearest vertical object when frightened, just as this one did as we stopped the car. You need to be a bit careful under these circumstances that the nearest vertical object isn't yourself! 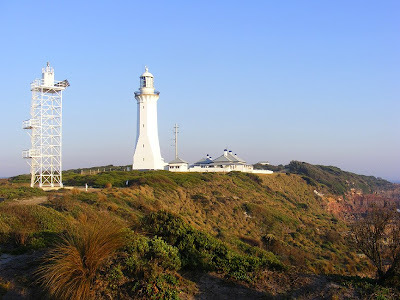 The Green Cape Lighthouse complex, showing the modern light, the old light and the lighthouse keepers' cottages, where we stayed. The wedding party (minus the best man, who was in hospital and couldn't make it). Fun with French – Hoopla ! Brightly pronounced 'OP-lah', this exclamation is used much more in the north than here in the Touraine. Here you might occasionally notice doting parents swinging a small child over a puddle using it in the sense of 'over we go' or 'wheee'. 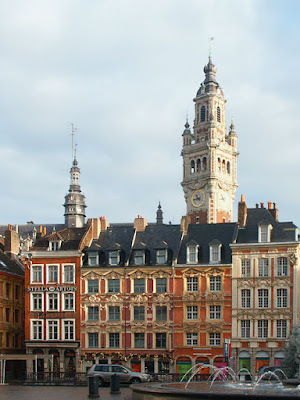 In Lille though, you could hear Hoopla ! several times a day. It is especially noticeable that when waiters deliver your meal they put the plate down with an Hoopla ! Apparently, producing the dish just as we ordered it is something of a magic trick in Lille. We found this rather disconcerting at first, fully expecting the next thing to be drum rolls and coins appearing from behind our ears. You can use Hoopla ! too when you pick up something that has been dropped and return it to the owner. It is just a slightly more ostentatious way of saying Voilà ! Yesterday was Sunday, and normally in Preuilly nothing happens on a Sunday. This is quite different to the rest of the week, where it appears that nothing is happening and quite often appearances don't flatter to deceive. (Or something). However, yesterday was different. All afternoon I kept hearing car horns parping. This is normally the preserve of Saturdays, when people are celebrating weddings. 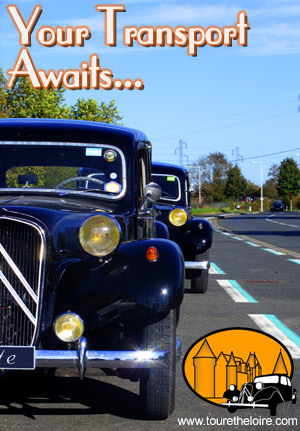 (If you're invited to a wedding, it appears traditional to drive from one place to another - possibly the mairie to wherever the reception is - leaning heavily on the car horn.) This was different though - Sunday and just the occasional, but still out of place for Preuilly on a Sunday, parp. As soon as I saw the ladies I grabbed my camera. A group of people standing around on a Sunday means something is happening. And I was right!! 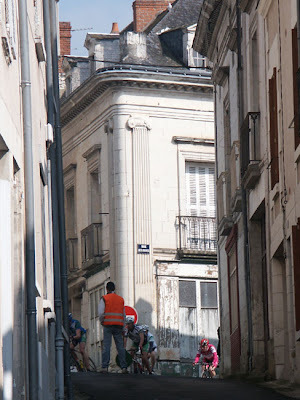 I then realised there was a chap in dayglo at the top of the street - was it possible that I could see the cyclists twice? It isn't the Tour de France, but it is typical Sunday afternoon activity - a course velo. 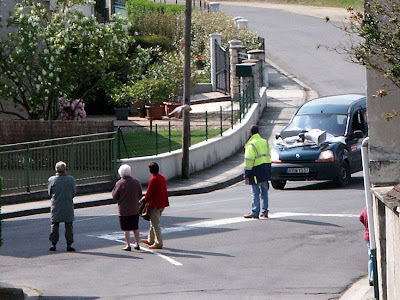 Anyone who has driven any distance on a Sunday in France will have seen them - and they have right of way. 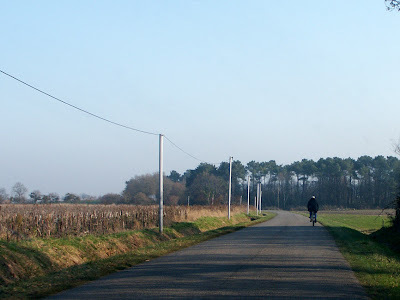 We last encountered a course in May last year outside Poitiers. Streets are blockaded, diversions put in place and hundreds (or in Preuilly's case, some) people stand on the roadside to watch. It isn't all two wheeled excitement here. 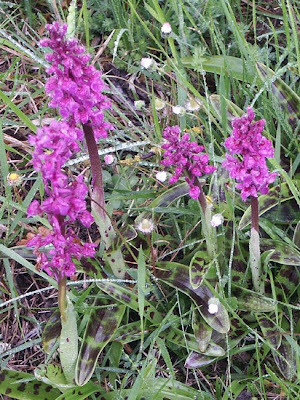 Yesterday morning I saw my first orchid of the year (Early Purple), but it was raining at the time, so I didn't tarry with the photos. Or rather, our new temporary kitchen. We intend getting a super-duper hi-tech fitted kitchen in the house, and have started getting devis from kitchen builders. Before this can happen, we have to clear all the old kitchen stuff - the strange faux ancien range hood and the sink. Until very recently (i.e. yesterday) I was cooking on a table under the range hood. As I intend to eat most days this means I had to find a new location for the kitchen. I decided on what we call our "small room" - not what you might think, but a little room off the end of our entry corridor that previously served as a combination bedroom/lounge, and more recently a dining room. It is more fancy than I had planned, but M. Bricolage in Chatellerault was having a special on melamine covered boards, so I treated myself to a bench top I can wipe down. 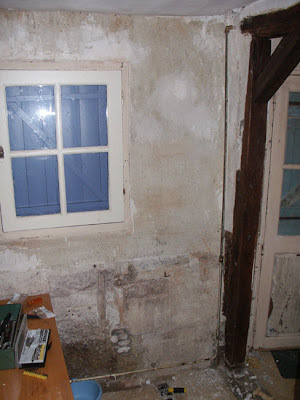 The only drawback is not having running water or a sink, but I am sure we can work our way around that. 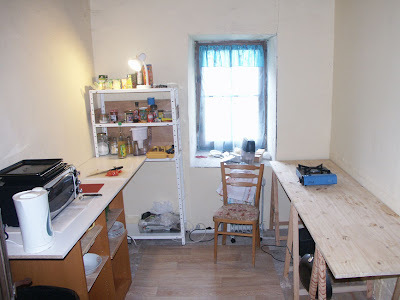 When we first moved to London the house we rented had a smaller kitchen than this, so we should manage quite nicely. If you have a well in your garden or in the street in your village, you need a way of getting the water from the bottom of a deep hole (our well is about 18metres deep) to the surface. As shown in a previous post, the "ye olde" (is there a French equivalent of that I wonder?) 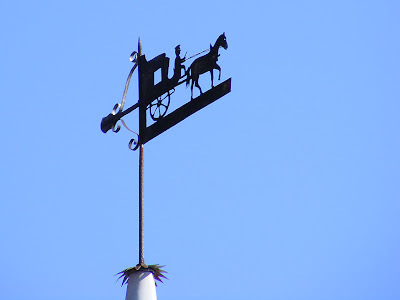 way is the method favoured in fairytales and nursery rhymes: a bucket on a rope, wound around a spindle. 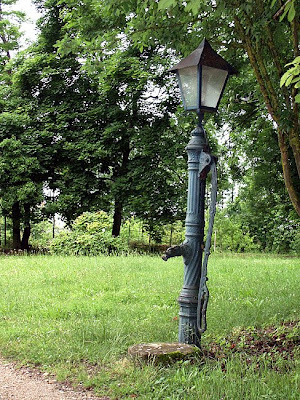 Anyone who grew up before town water came to town, and anyone who has visited the countryside will have seen force pumps. They are the pumps with a long arm you pump up and down, eventually getting water. 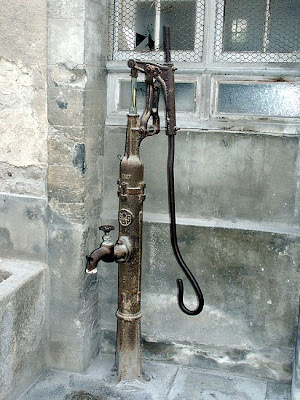 They use a series of valves creating a vacuum to lift the water and were supposedly invented by Ctesibus of Alexandria, in Egypt. The Roman writer Vitruvius mentioned this device in the first century B.C. and examples have been found in Roman cities, notably Silchester near Reading in England. 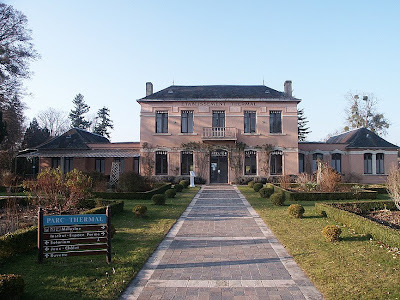 now home to the famous 'tapestry' In the garden of the château at La Celle Guenand. The other kind of pump is the centrifugal pump, which uses a spinning impellor to create suction and lift the water. This is usually done with a motor or engine and is the most common type of powered pump, but there are human powered versions as well. 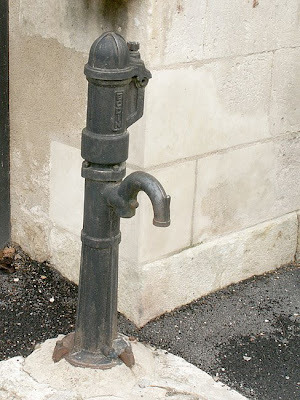 The original was invented by Frenchman Denis Papin in the late 17th century. My Personal favorite? 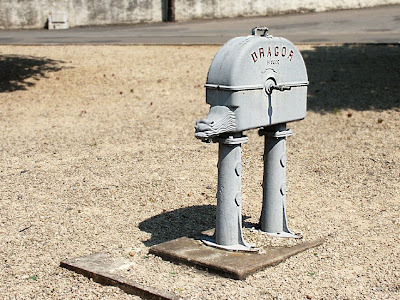 A toss up between the "Dragor" dragon, and the impressive if possibly impractical light/pump, I think. Avid readers may remember our PIAF (Plumbing Incident Annually in February), and the resultant rather basic facilities we were left with. 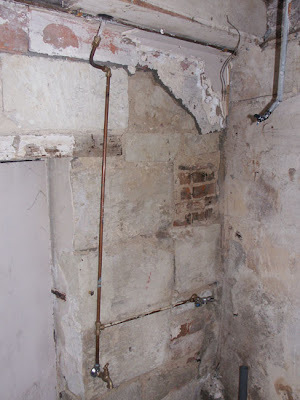 The main problems with the plumbing as it was last time we were here were; having to flush the toilet using a bucket, and only having one tap, low to the floor, which produced water. I am happy to announce that this situation is now resolved. After a rather long planning period (about 10 days of wondering if I could do it on my own, to be absolutely accurate) I went to Bricomarché and bought a huge collection of plumbing bits: joiners, angles, T-junctions, washers, olives (ask yer dad), tape and spare nuts. I took a piece of the old pipework I intended using to check I was buying the right diameter fittings (this is called "planning ahead" I believe) and was quite pleased with what I managed to buy, if horrified (as ever) with how much it all cost. Getting the parts home, I then carefully removed all the old pipework, as I intended re-using as much of the REALLY expensive copper piping as I could salvage. This went quite well, and I ended up with about 10 meters of reusable pipe. It was then I hit a snag. I had cut a section of pipe to make sure I was buying the correct fittings. Even cleverer, I had cut 2 sections of pipe from different places to check they were they same size. Unfortunately I had managed to find the only two lengths of 12mm pipe in the house - and all the pipes I was intending to reuse were 14mm. This meant I had 80€ worth of the wrong sized fittings. This was galling, but luckily I mentioned this as an aside to Jill, who told me John had done something similar (although hopefully not as comprehensively) and had exchanged them for the correct size. As I hadn't actually opened any of the packages I was able to return to Bricomarché and do the same. To cut a long story short (and I mean a REALLY long story with more twists and turns than the pipework I was replacing), we now have a flushing toilet (that's a relief) and taps in the laundry for a washing machine and dishwasher. I also have moved Pascal's tap into the laundry, and put it higher up the wall for easier use. The whole thing took me 8 hours non-stop muttering and forcing bits to fit, and I was so tired I missed my dinner, and the house is a mess because I had to take the laundry ceiling down, and I bumped my head on the low doorway 4 times, and now I can't do bending or standing up straight because everything hurts so much, but apart from that I am happy. 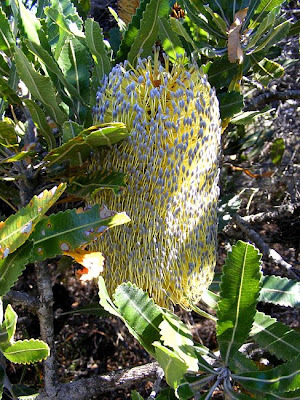 Recently I made a trip back to Australia, and for much of my visit, I stayed with my sister and brother-in-law. 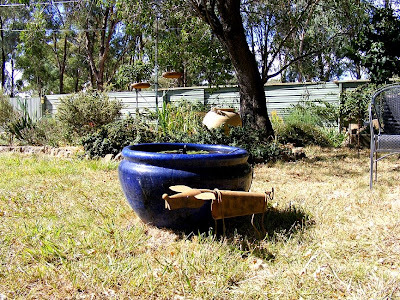 I thought readers might be interested in seeing some of the photos I took in their garden. This is a view of the back garden, which backs on to a bush park. 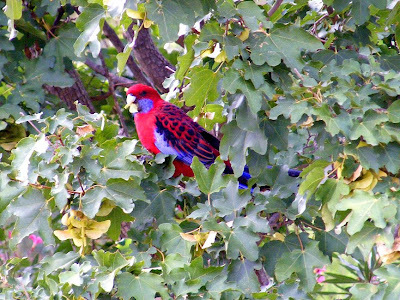 A Crimson Rosella Platycercus elegans eating the seeds of a sycamore in the garden. 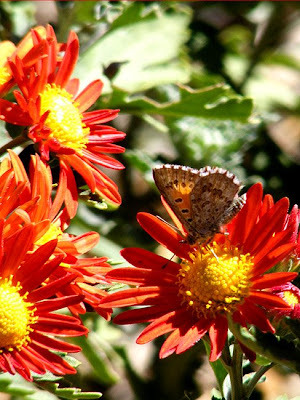 A Chequered Copper butterfly Lucia limbaria, very colour co-ordinated with the chrysanthemum it is feeding on. 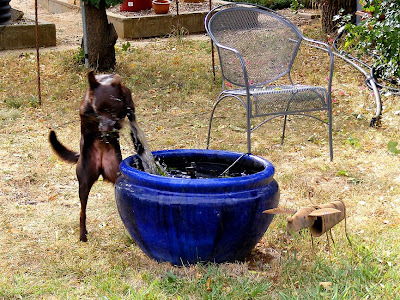 Bungee, my parents' dog, causing havoc in the waterlilies. 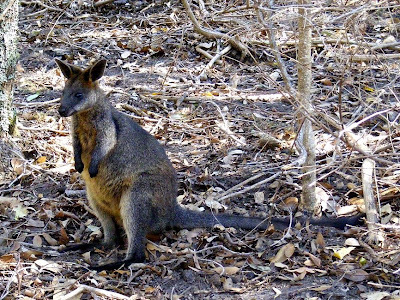 Bungee is a Kelpie, an Australian breed of cattle herding dogs. She is a lovely dark chestnut colour, very lively and clever, and difficult to keep from getting bored. 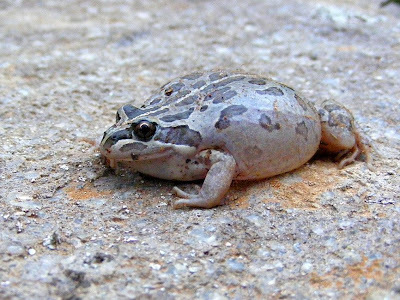 Early one morning she found this Spotted Marsh Frog Limnodynastes tasmaniensis. My father rescued it from her attentions, but it remained defensively puffed up for quite a while. 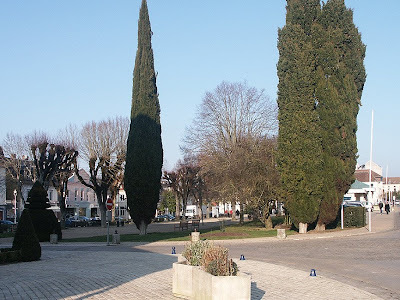 As you drive through Pleumartin it is easy to be distracted by the covered market in the centre of the town square. This is not Pleumartin's only curiosity - there is a little shop on the north side of the square that is well worth exploring. As you drive past you will notice gas bottles, some punnets of flowers and one or two other disparate items, but inside is a real Aladdin's cave. 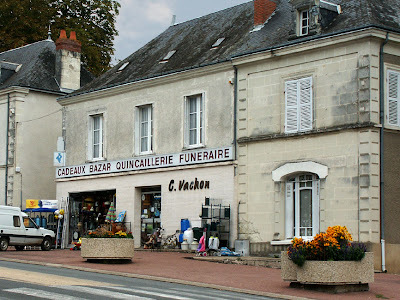 I first visited this shop when I was looking for disposable BBQ's to use on Tour de France day. They had; electric BBQs, charcoal, toys, headstones, paint, gifts, home decorations, tools, table linen, umbrellas, locks, fishing gear, videos, baby stuff, furniture, home electrical stuff, clothing, hunting gear... the list goes on (and on and on). This is possible because the building you see has had a number of extentions built out the back - quite possibly 25 metres worth of tin shed crammed full of wonders. I mentioned this place to Bengt who visited next time he was in the area, and I believe he was as impressed as I was. So if you're ever in Pleumartin, call in on a flimsy pretext. Just be careful - if you tell them you are looking for something, they may well have it! This last paragraph I am typing is special less because of what it says, than because I am typing it sitting at the computer in Preuilly, connected to the internet. The connection may look slightly Heath-Robinson (10 metres of telephone cable strung across the ceilings of two rooms), but the speed is 21st Century. 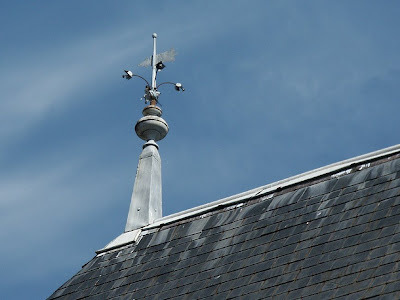 Having an internet connection tells me I need to get my own weather station - as I type this our weather panel says it is currently 9c and raining, whilst outside my window it is sunny with the occasional fluffy white cloud. 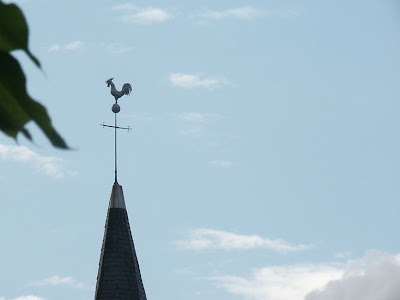 Every building with any pretentions to style has to have a windvane. 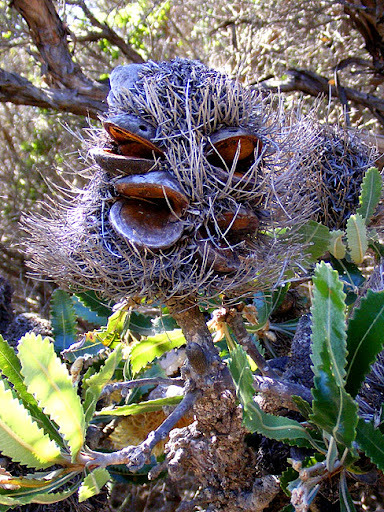 These three are not especially grand, but very typical of the species. So Who Delivers Your Easter Eggs?